The Next Gen hydro-drive aerator offers up to 42,550 sq. 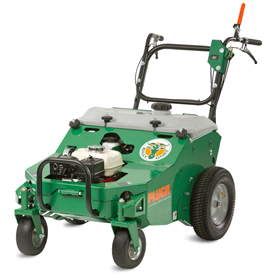 ft. of aeration per hour in a single pass, which provides operators with significant return on investment. Variable Aeration Density™, a Billy Goat exclusive, lets operators vary hole spacing from 8 to 45 holes per sq. ft. The unit features self-propelled rear-wheel hydro-drive and front casters for ultimate in-ground turning. Best in class drive controls match other Billy Goat hydro-drives for ease of customer experience across multiple products. Combined with patent pending EZ Lift n Drop™ tine engagement / disengagement for uninterrupted aeration, the Next Gen hydro-drive aerator makes maneuverability easier and operation smoother than ever before.